Some prehistoric beasts have been in disguise for centuries. For hundreds of years people across China have been finding giant dinosaur bones and using them to create the myths and stories of dragons. In France ginormous bones form the weird elephant relative, Deinotherium, were thought to belong to giant species of humans. There was one of these wondrous mythical creatures that was dispelled much earlier than any other, only to lay hidden for centuries. Established in 59BC by Julius Caesar, the Republic of Florence became one of the richest and most powerful cities in Europe by the 1600s. It is today as it was back then: money influenced power. Perhaps the richest family in Europe for over 300 years, the House of Medici had an enormous impact on the politics of Florence in the 1400s before becoming monarchs in the 1500s. This powerful family had a huge influence on the city in a surprising way: they had an unusual appreciation of art, funding many commissions across the city, sparking the Renaissance. Many of the great Masters (including those which were later re-christened as mutant turtles Leonardo, Michelangelo, Raphael, and Donatello) were supported by grand commissions by the Medici family. It was this openness to art, and more liberal views away from the strict religious doctrine of the time, that was extremely lucky for one young man. And for science. Danish born naturalist Niels Stensen, studied across Europe in his early 20s. In Holland, he discovered the parotid gland (the largest of the salivary glands). In Paris he was the first to correctly illustrate the complex anatomy of the human brain – no easy feat! He even declared that the heart was just a muscle: a very bold statement at a time when God was seen by almost everyone as the giver of life. Stensen was invited to Florence in 1665, by Ferdinando II de Medici, when he was just 28 years old. To be personally invited by the richest family in Europe was a huge honour. 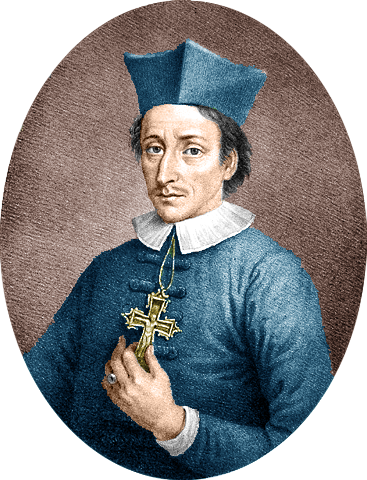 With the influences around him he soon converted to Catholicism, renaming himself Nicolaus Steno. Painting of Steno when he was a Bishop in later life, almost two centuries after he passed away. (Art by J. P. Trap 1868) Public Domain. Steno became Ferdinando’s personal physician and also tutored his sons. Steno was a bright, intelligent naturalist, and insanely curious. He created a moral rule for himself: “What we see is beautiful; what we know more beautiful; what we cannot grasp, most beautiful.” This is a maxim I would happily live by. How can we not behold nature that is so strange, so wonderous, as to be anything other than beautiful? In Florence Steno had time to explore the landscape around him. He looked at rocks, and found many ‘tongue stones’ known as glossopetrae, which were believed to have been the tongues of giant snakes and dragons. These massive triangular shiny ‘stones’ superficially looked a little like tongues, but there were a couple of people who suggested that they were actually the teeth of sharks. Steno used this as a test: he compared the tongue stones to dozens of different species of teeth from living sharks, and discovered that they were indeed teeth of a shark. Albeit, a bloody massive one. 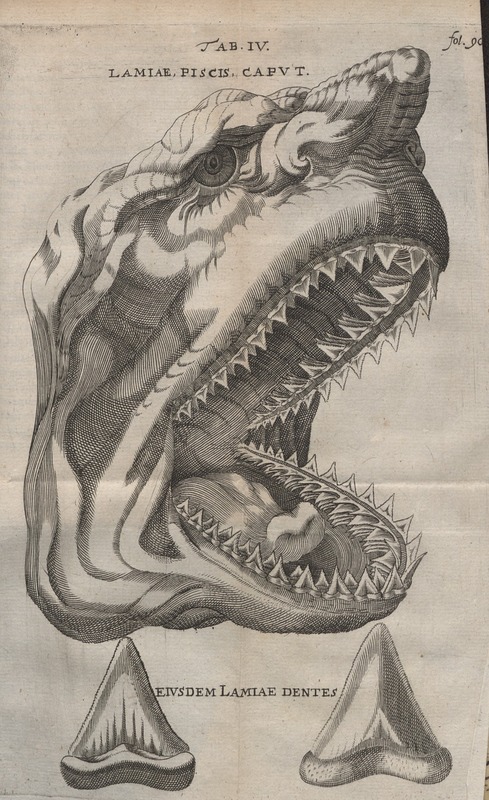 He published his work on his giant shark in a book with the catchy title that roles off the tongue “Introduction to a dissertation on the solid substance naturally contained within solids” in 1669. Steno’s published work was way ahead of its time. It spoke about animals that no longer lived – the concept of extinction was unheard of back then. It even suggested that the land had once been the sea – no one had imagined a dramatically changing planet. Maybe because his ideas were so heretical, or just so unbelievable, Steno’s work made little impact on his world. It lay hidden for over a century, and was discovered by Darwin’s idol, Alexander von Humboldt. Sharks are an incredible group of animals that sadly have a lot of negative views mainly from films, such as Jaws as well as media creating ‘deadly’ encounters. In fact, only around 5 people a year die from shark attacks around the world: a tiny number when you think that in America alone over 250 people die from falling out of bed every year. Their reputation for deadly killers is quite true. They have been on Earth for over 420 million years, and are perfectly adapted as some of the top predators in the oceans. And some were weird too, like the strange saw toothed shark, Helicoprion. With around 400 different species of sharks living today, they are an extremely successful group. Some are small. And some are big. 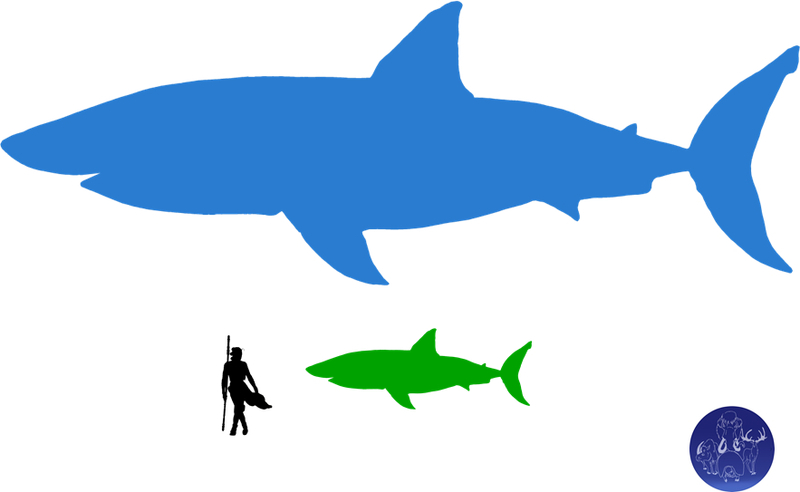 But there was, and is, no bigger shark than Megalodon. Shark bones are made of cartilage (if you put your finger on your nose, that hard bit on the ridge is cartilage). This is softer than the bones in you and I, and it really doesn’t fossilise well. The majority of Megalodon fossils are teeth – these are tough and hard and are preserved pretty well. A few vertebrae have been discovered, and one almost complete vertebra column was discovered. With the teeth and these few vertebra fossils, we have a pretty good estimate of the size of Megalodon, anywhere between 15 and 20 meters long (the largest great white shark is around 6 meters long). Sharks continually grow new teeth throughout their lives because they are often broken off when attacking prey or eating. And this means that many teeth sink to the ocean floor. And there have been an awful lot of Megalodon teeth found. They show that this shark was distributed worldwide, but mainly in temperate and subtropical environments. Megalodon ruled the oceans from around 20 million years ago until just the dawn of the twilight, around 2.6 million years ago. For such a giant creature, it needed some pretty big prey. Fossils show that youngsters were spending a lot of time in and near coastal lagoons feeding on fish, turtles and young whales. For the adults, there were a huge number of different whale species. Many fossil whale bones have teeth marks on them made by Megalodon. It would have been a formidable predator. With just teeth and a small number of bones, we don’t really know what Megalodon looked like. That almost complete fossilised vertebra column that was found provides a bit of a clue. Found in Belgium, it is the most complete Megalodon fossil so far found. It includes 150 vertebra bones, and it is likely that this specimen had over 200 when it was complete. Most sharks don’t have any where near this number in their vertebal columns. Except for the great white: it has a higher number than all other sharks. Megalodon and great white sharks have crazy amount of bones in their spines. Megalodon teeth also provide a clue to what it looked like: they are almost identical to great white teeth (apart from the gigantic size) suggesting a similar lifestyle, and similar shaped body. For such an enormous beast, and a very successful one, it is a bit of a mystery why it became extinct. It had successfully lived at the top of the food chain for around 20 million years (our species have only been on Earth for around 300,000 years). It’s extinction likely had something to do with the dawn of the twilight. The Pleistocene Epoch (starting around 2.6 million years ago) marks the beginning of massive changes in temperatures with enormous glaciers at the poles, and falling sea levels. Ocean temperatures dropped. North and South America joined together which changed ocean currents around the world. All of this had a huge impact on other marine life: whale diversity shrank around this time, and with the giant sharks main food supply disappearing, it too vanished. Ehret, D., Humbbell, G., & Macfadden, B. J. (2009). ‘Exceptional preservation of the white shark, Carcharodon, from the early Pliocene of Peru.’ Journal of Vertebrate Paleontology. 29(1). pp.1-13. Kimley, P., & Ainley, D. (1996). ‘Great white sharks: The biology of Carcharodon carcharias.’ San Deigo, California: Academic Press. Kuang-Tai, H. (2009). ‘The path to Steno’s Synthesis on the Animal Origin of Glossopetrae’. In Rosenburg, G. D. ‘The Revolution in Geology from the Renaissance to the Enlightenment.’ Boulder, Colorado: Geological Society of America. Nyberg, K. G., Ciampagilo, C. N., & Wray, G. A. (2006). ‘Tracing the ancestry of the great white shark Carcharodon carcharias, using morphometric analysis of fossil teeth.’ Journal of Vertebrate Paleontology. 26(4). pp.806-814. Pimiento, C., & Clements, C. F. (2014). 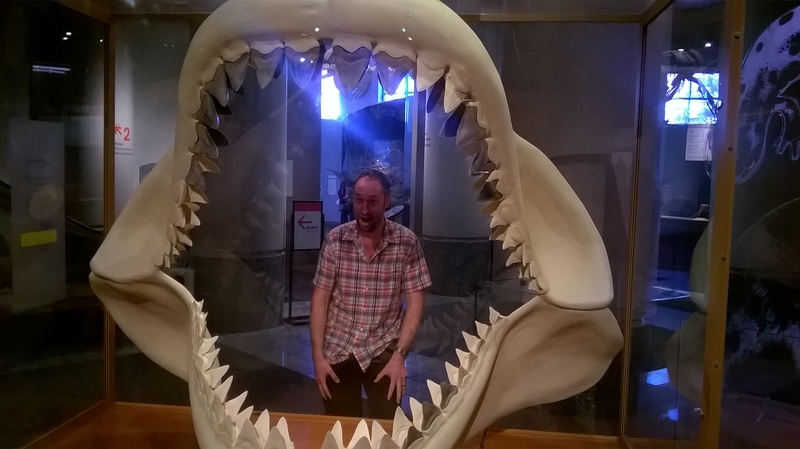 ‘When did Carcharocles megalodon become extinct? 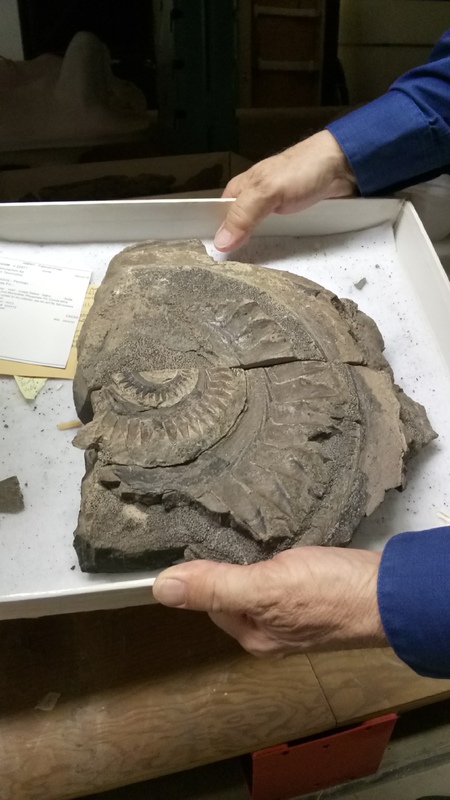 A new analysis of the fossil record.’ PLoS ONE. 9(10): E111086. Pimiento, C., et al. (2010). ‘Ancient nursery area for the extinct giant shark Megalodon from the Miocene of Panama.’ PLoS ONE. 5(5): E10552. Prothero, D. R. (2015). ‘The story of life in 25 fossils: Tales of intrepid fossil hunters and the wonders of evolution.’ Columbia University Press. Shimada, K. (2002). ‘The relationship between the tooth size and total body length in the white shark Carcharodon carcharias (Lamniformes: Lamnidae).’ Journal of fossil Research. 35(2). pp.28-33. Wendt, H. (1970), ‘Before the Deluge’. Paladin. This entry was posted in Megalodon and tagged Alexander von Humboldt, Carcharocles megalodon, Carcharodon megalodon, Deinotherium, Florence, glossopetrae, Helicoprion, House of Medici, Jaws, Julius Caesar, Leonardo, Louis Agassiz, Mariana Trench, Medici, Megalodon, Michelangelo, Nicolaus Steno, Niels Stensen, Raphael, The Meg. Bookmark the permalink.